Acting on a tip, Israeli troops ambushed a group of Palestinian militants holed up in an underground tunnel Saturday, killing six fugitives, including the most wanted man in the West Bank, Palestinian and Israeli officials said. Palestinian hospital officials said Islamic Jihad's top commander in the West Bank was also killed. In addition, the troops killed a seventh militant in a separate raid, as Israel stepped up a campaign aimed at rooting out militants in the West Bank's largest city. Nablus has been a center of militant activity during nearly four years of fighting. Also Saturday, Israeli border police clashed with hundreds of Palestinian protesters demonstrating against Israel's West Bank separation barrier, beating demonstrators and firing rubber bullets and water cannons to disperse the crowd. The violence occurred in the Jerusalem suburb of A-Ram, an affluent area inhabited by Palestinians who left the city to escape overcrowding. Dozens of people suffered from tear gas inhalation, and a news photographer was slightly wounded by police. A police spokesman said rioters had thrown stones, hammers and an ax. Meanwhile, Palestinian leader Yasser Arafat called for a cease-fire with Israel during the coming Olympic games in Greece, scheduled from Aug. 13-29. He made the offer at a lighting ceremony for an unofficial Olympic torch. 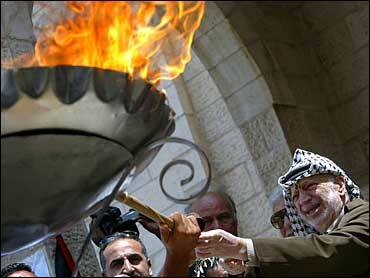 "On the occasion of lighting the Palestinian Olympic torch, I declare our respect and commitment for an Olympic truce," Arafat said. Israeli officials, who accuse Arafat of supporting militants, dismissed the offer as insincere. "There is a big difference between what Arafat says and what he does," one official said on condition of anonymity. In other news, U.S. Mideast envoy William Burns met with Palestinian officials, seeking to build momentum for Israel's planned withdrawal from the Gaza Strip. "I stressed President Bush's determination to do everything that the United States can to help seize the opportunity presented by the Israeli initiative," Burns said after meeting Palestinian Prime Minister Ahmed Qureia. Burns praised Egypt's efforts to help the withdrawal succeed. He also stressed that the Gaza pullback should be a step in the internationally backed "road map" peace plan, which envisions a Palestinian state in Gaza and the West Bank. Israeli Prime Minister Ariel Sharon refuses to negotiate with the Palestinians. Egypt, which borders Gaza, has served as a mediator and offered to train Palestinian forces ahead of the pullout, scheduled by September 2005. Israeli military sources called the raid in Nablus a "great success," saying the men the army had killed in the ambush were the main targets of a three-day operation. Forces were expected to withdraw soon, the officials said, speaking on condition of anonymity. They said troops had discovered the tunnel after spotting a suspicious man enter one building and exit a second building. The troops arrested the man, and he led them to the hiding place. The six men inside were attacked with grenades and machine guns, the army said. Among the dead was Nayef Abu Sharkh, a leader in the Al Aqsa Martyrs' Brigades. Palestinian and Israeli security sources said Abu Sharkh was Israel's most wanted militant in the West Bank. Israel Army radio said Abu Sharkh was responsible for a January 2003 double suicide bombing that killed 23 people in Tel Aviv. Palestinian hospital officials said Sheik Ibrahim, Islamic Jihad's top commander in the West Bank, was also killed. Ibrahim and Abu Sharkh's names had been listed on a leaflet Israel handed out earlier this week asking residents to turn them in. The other militants were identified as members of the Al Aqsa, Islamic Jihad and Hamas militant groups. Earlier Saturday, troops killed another armed militant. In all, nine Palestinians have died in the Nablus crackdown. Palestinian Cabinet minister Saeb Erekat condemned the bloodshed in Nablus and called for intervention by the so-called Quartet of Mideast mediators - the United States, the United Nations, European Union and Russia. "We condemn in the strongest terms the killing of nine Palestinians in Nablus. In a time we see Egyptian efforts and William Burns' visit, we see the Israeli escalation as an attempt to undermine their efforts," Erekat said. Meanwhile, Israeli police said nine people were arrested at the protest in A-Ram, which lies just yards from Jerusalem's city limits. Participants said about 100 foreign and Israeli activists were among the demonstrators. The construction planned there is one of the most sensitive sections of the separation barrier that Israel is building in the West Bank. Unlike fellow Palestinians with West Bank identity cards, most of the residents of A-Ram have Jerusalem cards that allow them freedom of movement in the city and throughout Israel. Large concrete slabs lay on the ground in preparation for the construction. The barrier will soon isolate A-Ram's 64,000 residents from their lifeline - Jerusalem. About 25,000 residents work in Jerusalem, and thousands of children attend school there. TV footage showed riot police pushing protesters to the ground during Saturday's confrontation. Witnesses said masked undercover police also moved into the area, beating protesters. A Palestinian photographer for the French news agency Agence France-Presse was beaten in the head and kicked by police, witnesses said. The photographer, Atta Hussein, was lightly wounded, hospital officials said. Israeli police said the forces had responded to violent rioting. They declined to comment on the reported beating, saying a complaint must be filed.